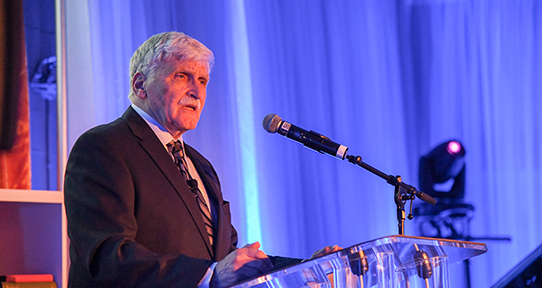 The Honorable Roméo Dallaire, retired lieutenant-general, former Canadian senator and best-selling author, was our keynote speaker and Public Humanist Award winner. 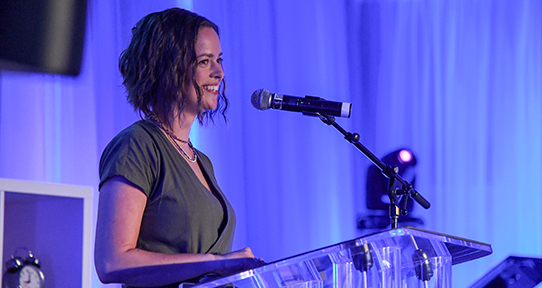 UVic alumna Ashli Akins received the Emerging Humanist Award for her work with the non-profit initiative Mosqoy. Humanities Dean Chris Goto-Jones paid tribute to our Historic Humanist Award winner, the late American science fiction and fantasy writer Ursula K. Le Guin, who died in 2018 at age 88. Once upon a time, not too long ago and not very far away, the Humanities were seen as the inheritors of a spirit of humanitas, embodying a commitment to action in society inspired by humane feelings such as compassion, sympathy, and empathy. Over time, the idea of humanitas became shaped by the ideals of a liberal education, gradually coalescing around three imperatives for living free and well: to be driven by humane feelings; to be guided by a broad, liberal education; and to take action in the world in order to make it better. While the content, dimensions, and origins of the ‘humane’ and the ‘liberal’ must be constantly contested and must be always responsive, torn between issues of race, gender, nation, economy, ideology, and imperialisms, the Humanitas Awards recognize those who strive with compassion, courage, and understanding. The Humanitas Awards celebrate the mission of the Humanities at the University of Victoria to enrich human dignity, to provoke critical inquiry, to engage myriad voices, and to provoke innovative expression. Three Humanitas Awards will be presented at an official ceremony in Victoria on a biennial basis, beginning in 2019. Incorporating public nominations and votes, the awards will be adjudicated by the Committee on the Public Understanding of the Humanities, chaired by the dean of Humanities at the University of Victoria. The three awards are: Public Humanist of the Year, for a living individual from anywhere in the world who personifies and embodies the ethos and ideals of humanitas; Historic Humanist of the Year, for a historical figure from anywhere in the world whose work in one or more fields of Humanistic endeavour has been important or formative in the development of the ideals of humanitas today; Emerging Humanist of the Year, for a graduating (or recently graduated) student from UVic whose accomplishments and promise contribute to the ideals and future of humanitas. A decorated lieutenant-general and former Canadian senator, the Honorable Roméo Dallaire served 35 years with the Canadian Armed Forces, was commander of the United Nations Assistance Mission in Rwanda, is the bestselling author of three books, and leads the Child Soldiers Initiative. Dallaire, who suffers from post-traumatic stress disorder, has also worked tirelessly as an advocate for veterans returning from combat. Read more about the Honorable Roméo Dallaire. Late American science fiction and fantasy writer Ursula K. Le Guin, who died in 2018 at age 88, will be honoured with the Historic Humanist award for her visionary work as a novelist and thinker. Le Guin wrote more than 50 books, including poetry, criticism, novels, and short stories, which defied genre and inspired legions of artists. She was named winner of the World Fantasy award for lifetime achievement, among myriad honours. In 2014, she accepted the National Book Foundation’s Medal for Distinguished Contribution to American Letters. UVic alumna Ashli Akins, who graduated with a Bachelor of Arts in 2009 with a double major in Latin American Studies and Environmental Studies and a minor in Professional Writing, will receive the Emerging Humanist award. Atkins founded the non-profit initiative Mosqoy, which has collaborated with Indigenous Quechua communities of the Peruvian Andes since 2006 to support the post-secondary education of more than 70 students and promote the artisan work of 150 women through fair trade. 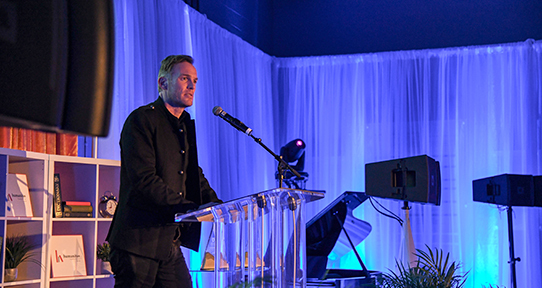 The Humanitas Awards was celebrated at a gala event on March 15, at the Baumann Centre in Victoria.